* All prices in CAD. Checkout on a secure 256-bit SSL encrypted cart and payment page. Why do you we reach for that piece of chocolate? Going on “another diet” is never going to solve your food, diet, or over-eating issues. You’re not going to maintain your weight or weight loss on yet another fancy diet with restrictions and rules. Going on another diet addresses the symptom, not the cause, and in doing so, can actually make matters worse. This book gets to the root causes behind your food, eating, or weight issue. If you struggle to keep weight off, or if you struggle to stick to a diet for longer than a few weeks, this book is for you. It’s about addressing your habits and the underlying causes behind your food issues. In the modern world, we are seeing raising body weights, an increasing prevalence of food addiction, overeating, and eating disorders. The previous “unconscious mechanisms” that kept our body weights in check have disappeared. Part One addresses all the various ways things are stacked against us in our modern world. It discusses the reward center of the brain, and how it interacts with various modern environmental and cultural influences that cause things like food addiction and overeating. 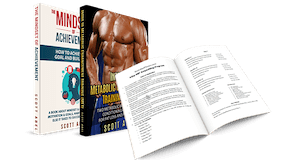 It talks about how our bodies are evolved to fight against fat loss, and prefer weight gain. It talks about recent changes in food industry, and the ways in which it specifically engineers “hyper-palatable” foods that have a very specific effect on your brain and your psychology. It discusses the importance of cues, your emotions, stress, and what every person needs to be “aware” of if you are going to truly solve your food, dieting, or weight issues. The main argument here is that a food or eating issue is actually rarely a metabolic issue. Most of the time there are other things at play. Part Two is all about solutions to food, dieting or over-eating issues. The solutions are not metabolic, or about going on another diet. This section is about higher (self) awareness, the truth about behaviour modification and habit reversal, and what it truly takes to get rid of an eating or food issue. There are no “one-size-fits-all” simple recipes for this kind of thing — because each food issue is unique, so too will each solution be unique (even if the principles underlying the solutions are the same). Part Two is about becoming more aware, and learning to listen to your own body, your brain, and your thoughts, to achieve a higher level of food awareness. There are specific instructions you can follow, with advice about applying them to your own situation. Buy your copy of Beyond Metabolism now, and become more aware of of what’s REALLY affecting your food eating habits and behaviour, and what you can do about it.